Hsain Ilahiane originally came to Lexington because of the quality of UK’s anthropology department, but in his two short months of living here he’s already come to love the Farmers Market, which he and his wife, Ann Becker, have been taking advantage of to the fullest. “It’s very enjoyable for me to go and talk to the famers,” Ilahiane said, in addition to having access to fresh produce. His current research interests are largely centered in studying information and communications technologies, but prior to that he was studying small scale farming. Farming was also involved in leading him into the field of anthropology. While working on his master’s degree in international development at George Washington University, Ilahiane read “The Theory of Peasant Economy,” by Russian agricultural economist Alexander Chayanov, an article on farming in the Soviet Union. The piece reminded him a great deal of the little farm he grew up on in southeast Morocco. He found the article so interesting that he asked one of his professors about pursuing similar topics. The professor directed him toward further study in either sociology or anthropology. Obviously, anthropology won. For the past eight years, Ilahiane has been studying ways to make mobile phones accessible to various populations of the developing world. He is interested in studying how mobile phones can be used to help improve socio-economic status and political empowerment. Ilahiane was further attracted to anthropology because of the field work necessary to gather this experience-dependent data. “Anthropology allows me to go and live with people and participate with them,” he explained. “The [research] methods were very attractive to me.” He really enjoys interacting with people and understanding them and how they relate to their environment. With anthropology, instead of looking at people from a distance, you have to really hang out with them and discover, for example, how they use their mobile phones and what problems they have with them. 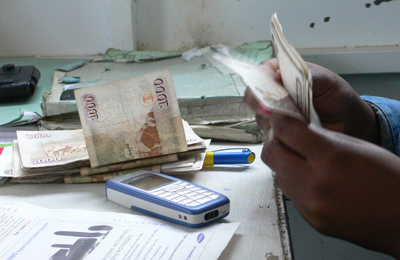 During the time that Ilahiane has been studying the use of mobile phones, companies in Kenya have launched cutting edge technologies for doing banking via cell phones, essentially turning the mobile phone into an ATM machine or a virtual wallet. Called M-Pesa, the technology makes it easier and more cost-effective for urban workers to transfer money to the rural family members they’re often supporting – rural family members who usually don’t have easy access to banking locations. One of Ilahiane’s current research projects involves studying why people were attracted to this technology and what is special about M-Pesa’s design. He’s also researching how models of Islamic charitable institutions could be used to financially sustain telecenters in developing countries. Telecenters are a type of community center that provides community members with minimally-expensive access to computers and information. These telecenters can be important for community development and for empowering people by giving them access to information. Ilahiane’s interests in relations among people of different ethnicities were encouraged by his childhood household: his father came from a family of sedentary farmers, while his mother’s family was nomadic. The dynamics of their contrasting backgrounds resounded with him. Ilahiane comes to UK after 10 years at Iowa State University, during which time some of his research was funded by the Intel Corporation. As he settles in at UK, he’s excited about the diversity of research his colleagues are involved in, from biological and medical anthropology to development anthropology and archaeology. There’s much to like about Lexington beyond its Farmers Markets, and Ilahiane is gradually learning his way around. One settling-in task not yet completed, though, is finding time for some pick-up soccer games, he notes with a laugh. So if you find yourself short a player the next time you pull out the soccer ball, you should try calling the anthropology department. Ilahiane would likely see that as a very appropriate use of mobile phone technology.